The United Nations World Conference on Disaster Risk Reduction, which took place in Sendai, Japan, between 14 and 18 March 2015, resulted in a historic agreement by the international community to reduce disaster risk, and recognized local authorities and the local level as essential to achieving this. Strongly represented at the Conference, local and regional authorities showed the world that they are fully engaged in the risk reduction process at all levels. This represents an important technical and political step by local and regional governments and their networks around the world to strengthen their role and capacity in risk prevention and reduction. For the first time, the Sendai Framework for Disaster Risk Reduction 2015-2030 recognizes that local authorities have a crucial role to play in disaster risk reduction. The local level and local authorities are mentioned many times in the final text. In her address during the opening session of the meeting, the Special Representative of the United Nations Secretary-General for Disaster Risk Reduction, Margareta Wahlström, emphasized the essential role of local governments in this area. She highlighted the progress made since the adoption of the Hyogo Framework for Action in 2005, given that, today, it is impossible to drive real local strategies for risk reduction without the effective participation of local governments. She also recalled that increasing urbanization has substantially increased the risks for people, especially in coastal areas, and that local authorities are on the front line when it comes to providing adequate responses. In this regard, the Declaration encourages strengthening the technical and institutional capacities for managing disaster risk reduction, including in the areas of technology, training, and the human and material resources of local authorities. Finally, the Sendai Declaration of Local Authorities emphasizes the need to connect the Sendai Framework for Action with the fight against poverty, the urban agenda, the fight against climate change and the Post-2015 agenda. 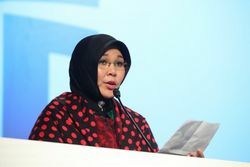 Following the approval of the Sendai Declaration for Local Authorities, the Mayor of Banda Aceh, Indonesia, Hj Illiza Sa-Aduddin Djamal, presented the official position of local governments, united under the “Local Authorities Major Group”, before the Ministers and international organizations present. Cities are the first level of governance dealing with disaster risk reduction. National governments must develop strategies together with local authorities in order to build their capacities. This can only be done if there are improved local-national dialogues and decentralization processes are undertaken to give the necessary powers and resources to local authorities. This would also help local authorities to better evaluate, monitor and ensure reporting on disaster risks. Finally, she recalled the strong commitment of local governments all over the world, through UCLG and ICLEI, to take concrete action against risks, particularly in the framework of the “Making Cities Resilient” campaign. Fatimetou Mint Abdel Malick, Mayor of Tevragh Zeina in Mauritania, recognized as a “Champion” by Ban Ki-moon, advocated for greater recognition for women in risk reduction, and more generally, for greater acknowledgement of women’s contributions to local development. She shared the gender equality policies implemented in her municipality and within the various districts of Tevragh Zeina. The need to better connect the new agenda on resilience with the global urban agenda that is currently being defined (Habitat III) and the new development agenda (Post-2015 Sustainable Development Goals) was also raised. The success of local governments in Sendai should be seen in parallel with the work carried out within the framework of the Global Taskforce of Local and Regional Governments for Post-2015 Development Agenda towards Habitat III.